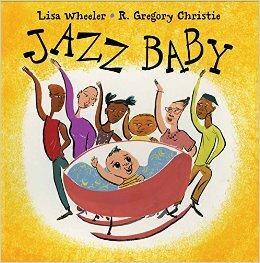 Jazz Baby, an oldie (2007) by Lisa Wheeler, that proves the music is the universal language that transcends age, time, and most importantly, dance moves. In the book, a very musical family claps their hands, snaps their fingers, and sings their heart out to a jazzy tune. As they do, the littlest member of the family – the Jazz Baby – mimics his loving family from his crib. Lisa Wheeler’s prose offers that special smooth choppiness that is unique to this genre of music. It manages to light a body-bouncing fire under Jazz Baby in the opening pages, then lull him to sleep when the time is right. This one is great for Black History Month, discussions about diverse books, and/or early elementary music classes that introduce the various genres of music.